If you liked the look of the Thermaltake Level 20 GT RGB, I reviewed last year but can’t afford the £250+ price tag then the Level 20 MT ARGB could be the case for you. Priced at a very reasonable £84.98 on Scan or £79.99 with Overclockers this case offers both premium features and looks for RGB fans on a budget. 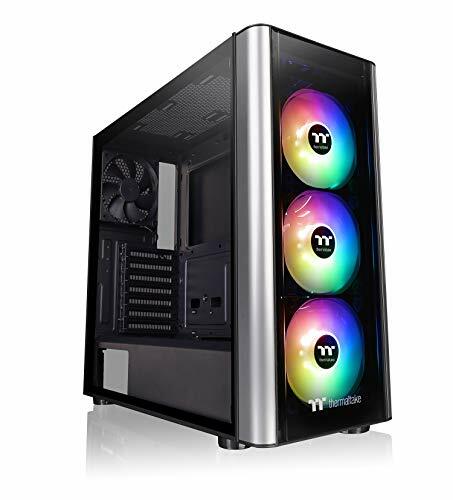 While this may adopt the Level 20 design, the case itself has far more in common with the Thermaltake V200 RGB having the same overall build and features. They are not exactly the same though, the Level 20 MT is just under £20 more on Scan but uses ARGB fans that offer a more impressive look than regular RGB. The case features three 120mm ARGB fans which are located in the front of the case with one none LED fan for the exhaust on the rear. Similar to the V200 it is quite light at just 6.75 kg compared to the 20+kg of the Level 20 GT. There are tempered glass panels on the front and left-hand side with the right-hand side being a thin slide on panel, and the top a vented panel similar to the V200. and a range of different colour options. RGB Fusion, MSI Mystic Light Sync and AsRock Polychrome. so not the quietest but hardly like a jet engine. There is however dust filter on the side, top and bottom. but it does make it easy to clean. Inside the case, you can fit ATX motherboards or smaller, and there is CPU clearance of 170mm and VGA lengths up to 366mm without radiator on the right side. PSU sizes can go up to 170mm in length. have 2x120mm on the bottom intake or the side. For radiators you can get up to 360mm in the front, 240mm on the side (where the side vent is) and 120mm on the rear. choice is always a good thing though. With this case, you pay £30 extra compared to the View 22 or about £20 more than the Thermaltake V200. Each case looks different, but the main functional difference is the fan arrangement. The View 22 has no included front fans, while the V200 has three RGB fans (not ARGB). Out of the three I would say the V200 is the best buy, the ARGB maybe worth the extra £20 but I would argue that it is money better spent on cooling or a better motherboard, CPU etc. Overall though, this is a good case, and for the price, it is still a great buy allowing people on a budget to achieve premium looks. A decent affordable PC case with ARGB fans but it is eclipsed by the cheaper V200 previously reviewed.